Family members and other people set fire to trucks owned by a mining company. Four people were killed in an accident when a truck and a state transport bus collided in Gadchiroli, Maharashtra today. Among those 4 people were students, the police said. Superintendent Shailesh Balakawade of the Gadchiroli Police said relatives of the victims along with locals started to set fire on 10 trucks which belonged to a local mining company. The accident happened around 8 am today, when a bus that carried around 50 passengers (mostly students) was on bound for Alapalli, as it was making a turn, a truck suddenly came and hit the bus, leading death to 4 and injuring the others. When passers and locals came to the scene, they recovered 4 dead bodies which included a forest department employee, woman official, and two students. 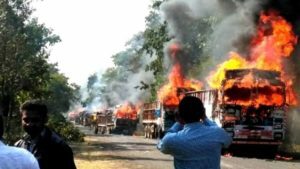 Family members and other people from the neighboring villages started a roadblock while others started to set fire to the mining company’s trucks. The injured passengers were rushed to the nearest hospital for immediate treatment. The police have enhanced the security measures in all the roads that are near the accident to attain peace and order.